At 3:45 am on January 28, 2017, oil began to wash ashore off the Ennore coast of Chennai, India destroying marine life, livelihoods, and causing permanent damage to biodiversity. 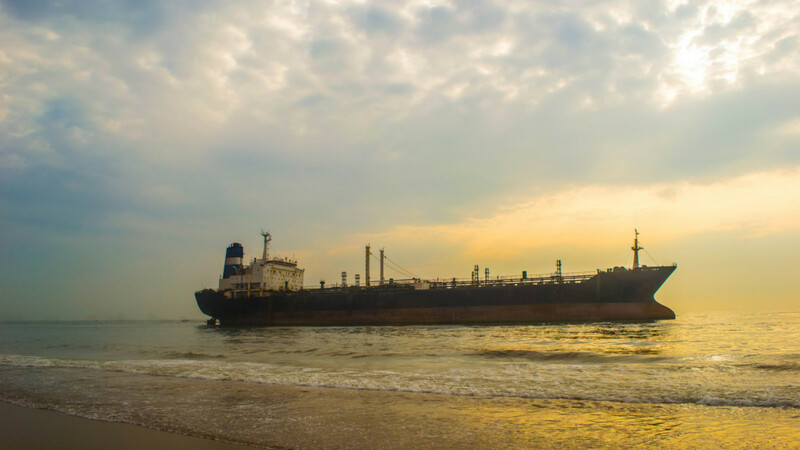 Two ships, the Dawn Kanchipuram and the Maple, collided and dumped the 21,141 gallons of toxic heavy fuel oil into the Kamarajar Port waters. The sludge washed ashore covering an area of 34,000 square meters of coastline, wetlands, and ocean water. The sensitive ecosystem is home to suburbs, commercial fisheries, and is one of the dwindling global nesting sites of the vulnerable Olive Ridley Turtles. Information regarding the cause and volume of the spill itself, methods and timeline for remediation, and safety and livelihood concerns for the local community have been described as confusing, contradictory, and piecemeal. 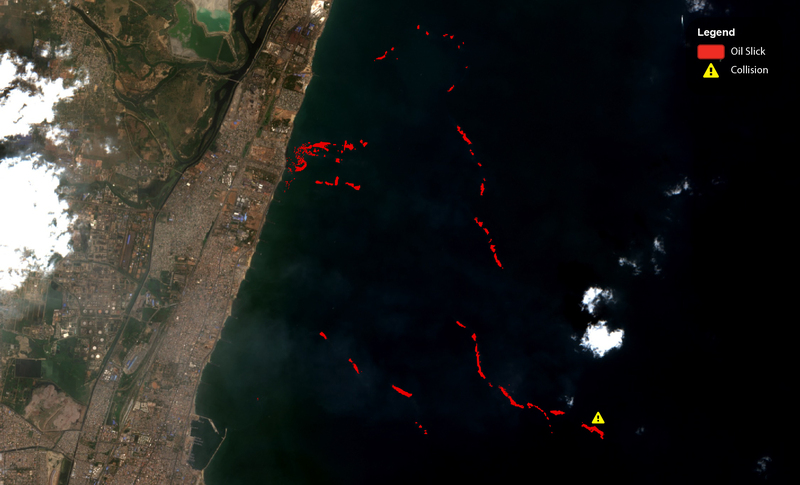 Following the spill, we used Satelytics to process imagery over the Indian port waters to map the extent and movement of the spill. 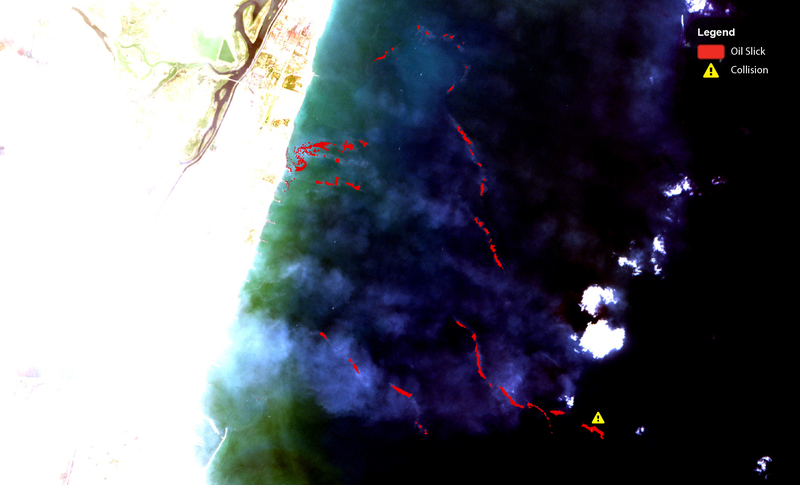 What follows is imagery taken in February shortly after the collision; both before and after the Satelytics analysis. With Satelytics, the extent and coverage of the spill is made clear using the same algorithms we use to detect offshore oil spills around the world. Even when a spill appears to be invisible to the naked eye, using spectra in the infrared and nonvisible portions of the electromagnetic spectrum allows us to detect what the human eye cannot. Satelytics is a software suite that allows oil & gas companies to not only monitor infrastructure for potential threats and spills, but also quantify and monitor remediation projects after an event has occurred. While Satelytics couldn’t prevent the collision, it’s an ideal tool for concentrating remediation efforts, verifying efficacy, eliminating risk, and reducing associated consequences and costs. This same technology can be used to monitor offshore oil platforms, pipelines, and other infrastructure for potential leaks and threats including human activity, erosion, land movements, and vegetation overgrowth. As always, prevention is more cost effective than the remediation, PR, regulatory, ecological, and operational costs of an oil & gas incident.